Successful corn stand establishment is the foundation for high yield and profitability. It is driven by soil conditions during preplant tillage and planting, along with the date, depth, and rate of planting. Consider the following guidelines to reduce risk and maximize economic net return. Avoid preplant tillage and planting when soils are wet. 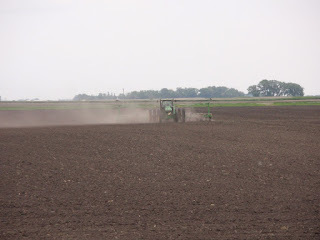 A field is ready for seedbed preparation when soil in the depth of tillage crumbles when squeezed. Tillage in wet soil causes clods, which reduce seed-to-soil contact. Excellent seed-to-soil contact is essential for rapid imbibition of moisture by seeds and uniform emergence. Tillage in wet soil also creates a compacted layer below the depth of tillage, which can restrict root development. Sidewall compaction can occur when planter disc openers cut through wet fine-textured soil, resulting in compacted soil around the seed that is difficult for roots to penetrate. Seed furrows can also open after planting in such conditions, resulting in poor seed-to-soil contact. It is important to avoid more preplant tillage than necessary. Excessive preplant tillage reduces soil moisture in the seed zone. It can also lead to crusting of surface soil if there are heavy rains, which can restrict corn emergence. Excessive preplant tillage also increases the risk of wind erosion and sandblasting to corn seedlings. Risk of inadequate stand establishment is reduced if corn is planted when soil in the seed zone has reached or is near 50°F and is expected to warm. Maximum corn yield in Minnesota is typically achieved when planting occurs in late April or early May. In years when warm weather arrives earlier than normal, planting in mid-April can produce similar yield if young corn plants are not significantly damaged by a freeze in May. A planting depth of 2 inches is optimal for corn in most situations in Minnesota. Shallow seed placement increases risk of poor nodal root establishment. Excessive planting speeds that result in bounce of planter units and inconsistent planting depth should be avoided, since shallow seed placement can hinder emergence and nodal root development. Optimal planting rates for corn in Minnesota are generally 34,000 to 36,000 seeds per acre. This can vary somewhat with hybrid, soil productivity, expected yield, and other factors. Too great of planting rate generally does not reduce corn yield but can reduce economic net return.